I have been kicking around the idea of offering a button share for some time...well, IT'S FINALLY HERE! I have two versions of this button share, so please read carefully. With these shares I will fill groups of four. Once I have filled a reasonable number of shares, I will place the order with Stampin’ Up! I will fill the shares in the order they are received. 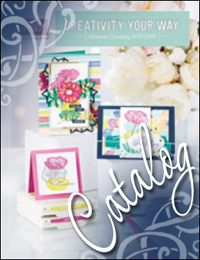 Please allow 2-3 weeks for delivery based on availability from Stampin’ Up!. You will be notified should buttons be placed on back order. Orders will be shipped 1st class mail in a bubble mailer. Shares are only available in the United States. With this share you will receive one button in each size and color from the four designer button color families offered in the 2010-2011 Idea Book and Catalog. In addition, you will also receive one each of the new Candy Cane and Deck the Halls buttons featured in the new Holiday Mini Catalog for a total of 96 beautiful, high quality buttons to use on your stamping, sewing, and craft projects. Price: $21. With this share you will receive all 96 buttons from the option one share and a bracelet kit (8” medium cable chain with closures and 48 jump rings). If you need a longer chain, please specify with your order. Please note: the jump rings will be the size needed to complete a sampler bracelet using the small and medium buttons from the four designer color families. You will need a set of jewelry pliers to assemble your bracelet (not included). Price: $26. To order, please email me at Connie@ConstantlyStamping.com. This is an exclusive share offered by me, Connie Collins, Independent Stampin’ Up! Demonstrator. Please include your name, shipping address, telephone, email address, and which option you choose. I will send you an invoice by PayPal confirming your order. Tags: Designer Button Share, Stampin' Up!